MINDANAO, Philippines (Morning Star News) – An ascendant terrorist group in the Philippines that has pledged allegiance to the Islamic State (IS) yesterday wreaked violence on the island of Mindanao, kidnapping a catholic priest and 13 members of his parish. Soldiers engaged in firefights with the Maute Group (MG) in Marawi City as its militants reportedly beheaded a police chief, kidnapped the priest and others, burned their cathedral and other buildings and raised the black flag of IS. Marawi is predominantly Muslim. Authorities identified the abducted priest as the Rev. Teresito “Chito” Suganob, vicar-general of the prelature of Marawi, who was at St. Mary’s Cathedral when a group of armed men barged in and abducted him and 13 other parishioners. Reports indicated 10 worshippers and three other church workers were abducted. Suganob is well-known in Marawi, in Lanau Province, and parishioners appealed for prayers using social media. 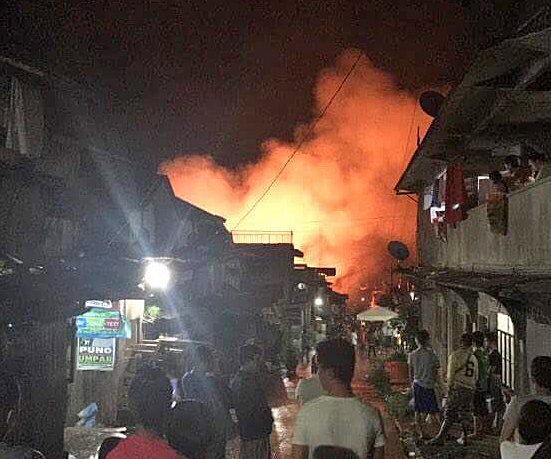 Besides the cathedral, the assailants reportedly burned down three buildings of Dansalan College, which belongs to the Protestant United Church of Christ. Prior to Tuesday’s violence, police backed by Philippine soldiers in Marawi raided the hideout of suspected Islamic terrorist leader Isnilon Hapilon. The Maute Group on Tuesday (May 23) subsequently killed at least two soldiers and beheaded a policeman they had stopped at a checkpoint. Hapilon, a commander of the Islamic extremist Abu Sayyaf militant group, has a US$5 million reward offered by the U.S. State Department for information on his whereabouts. Duterte said the report of a police officer’s mutilated body strengthened his resolve to declare martial law for 60 days in Mindanao, expanding the military’s power to detain suspects without charge. He said he may declare martial law nationwide if authorities confirm that IS is involved. 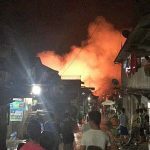 The sounds of gunfire caused the public to panic, and thousands fled Marawi City towards Iligan City and Malabang Municipality. Khye Amerol, who fled to Malabang, said that even though the military claimed that calm has been restored to Marawi, he had to leave for fear of stray bullets, according to the International Business Times. The mass evacuation caused traffic congestion from late morning to evening. Clergymen have often become hostage victims of local terrorist groups operating in the southern Philippines. Last week Islamic extremists threatened Muslim preachers about to participate in an anti-terror summit organized by the Autonomous Region in Muslim Mindanao (ARMM). An ARMM official received an email from a local terrorist group ordering her to discourage Muslim leaders from attending the summit. The summit ended peacefully on Friday (May 19). The Maute Group is one of the newest but most feared terror groups in the southern Philippines; it became better known in November last year when members raided Butig town in Lanao del Sur and raised an IS-similar flag in the town hall. MG engaged government soldiers, and since then the administration has not taken the group lightly. Poverty in impoverished areas in the southern Philippines has contributed to ordinary civilians willing to fight the government. Feeling excluded, militant and revolutionary organizations in Mindanao would like to establish an autonomous government. What they did was not just an attack on the Christians, they attacked the whole city and that includes even us, Muslims. Leaving us Muslim members of the community of Marawi with no choice but to leave our homes. And for the record, we left Marawi because there is not stability to speak of. The claim of the military is non existent. This is not even about autonomy. What they are doing are plain atrocities. Do not speculate as they have not yet made known what are their goals. When they were roaming, firing ammunitions INDISCRIMINATELY, they were shouting about something that SOLDIERS have killed some of their women. And thus, they are motivated by that alleged incident to seek revenge for their women. They did not speak anything about autonomy and we Muslim member of the community of Marawi, certainly do not want and do not know anything that has to do with the Mauti group. We are not supporting them in any way. Let us not spread unverified infos. Please. As they can be very poisonous especially at times like this. This is truly tragic. You have to wonder if Digong plotted with his allies in the insurgent groups to give him absolute (Martial Law) control, as with Marcos. Moreso, like swimming in a bay of sharks, there is no good reason for Christians to be living in these fundamentalist-controlled areas of Zamboanga / Sulu / Baslian / and surrounding towns.